Georgioupolis is an idyllic fishing village on the north-western coast of Crete. A popular seaside resort, known for its long, fine sandy beach and shallow, crystal-clear waters. Georgioupolis forms part of the municipality of Apokoronas in the Prefecture of Chania in Crete. It is situated on a beautiful bay by the longest sandy beach on the island, in a river plain lined with Eucalyptus trees, merging further inland into a glorious mountain landscape which beckons to hikers. The cities of Chania and Rethymno are not far away. 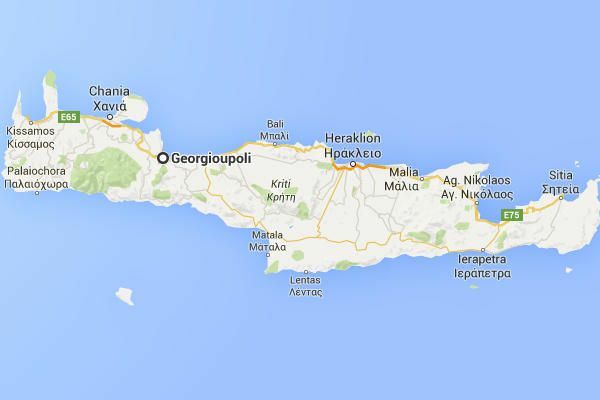 Georgioupolis is located about 35 km east of Chania and approx. 22 km west of Rethymno: a very quiet, but central location on Crete, ideal for holidaymakers who would also like to explore the island. The village is adjacent to the island’s main road, meaning that it is well connected whether by bus or car to the ports and airports in Crete, as well as anywhere else on the island. Georgioupolis is a very popular holiday destination, especially among holidaymakers from european countries. Georgioupolis was first founded at the end of the 19th century under the name Almiropolis, but was then renamed Georgioupolis in honour of Prince George of Greece, the first High Commissioner of Crete. This heavenly spot is ideal, especially for visitors and tourists who want to enjoy a relaxing beach holiday and still prefer to be in a lively, centrally located seaside resort in Crete. For Georgioupolis always has something to offer its guests: modern hotel facilities, traditional Greek tavernas, cafés, restaurants, bars, supermarkets, confectioners, and numerous souvenir shops and small stores invite you to peruse at your leisure! When you arrive in Georgioupolis, the diversity of this unique place will strike you immediately. On one side you have the curve of the bay, while on the other lies the impressive 'Lekfa Ori' range (White Mountains). In between, you will find three small rivers that flow right through the town. Behind the town, about five kilometres inland, lies the only natural fresh water lake on Crete, Lake Kournas, surrounded by an impressive mountain landscape. Driving from the old main road, you will pass through an impressive avenue of fragrant eucalyptus trees. These were planted at the beginning of the 20th century, in order to drain the moor landscape which was expanding at that time. Fortunately, the wetland refused to disappear entirely, because it is now under conservation and, what’s more, is a nesting site for various species of birds and animals. At the town centre, you will then find the 'Platia', the village square, which boasts a variety of tavernas and cafés. Further towards the sea, a new area has been built with a play area, a skate park, benches and a water park for young and old alike. And right next to it, of course, is the village fishing harbour. It is located under the bridge and at the mouth of the river Almiros, which is only about 1 km in length. The river water is home to turtles and various bird species, among other wildlife. Moreover, it’s particularly suitable for small boat trips. In addition, you can still observe fishermen there today, fishing in the traditional manner with large nets. The Chapel of Agios Nikolaos is also extraordinary. This top tourist attraction was erected about a century ago right on the sea by a sailor. Agios Nikolaos is the patron saint of sailors, and the church was therefore named after him. The chapel can only be reached by a stone causeway. It’s well worth visiting, as it offers a beautiful view over the beach and town. Wedding ceremonies are also held here during the summer months. The glorious, almost endless beach of Georgioupolis consists mostly of fine sand. It is considered the longest sandy beach on Crete. It’s over 10 km long and ranges (interrupted by some rocky promontories) almost as far as Rethymno. The quality of the sea water and the cleanliness of the beach has been of such a high standard for so long that it received the blue flag. There are also lifeguards in beach huts on many sections of the beach in Georgioupolis. On these parts you will always see flags indicating how safe it is to swim in the sea. Georgioupolis beach promenade begins to the right of the harbour and the Chapel of Agios Nikolaos. It was renewed as recently as 2006. 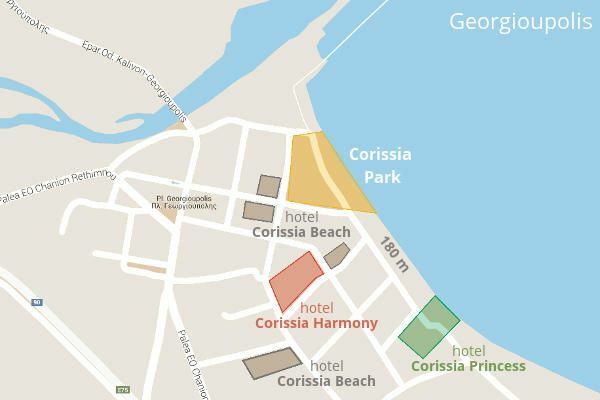 Along the beach promenade, you will find the Corissia Hotels and Corissia Park. This first stretch of beach is very child-friendly, because the beach descends very gradually into the sea. Moreover, it is well protected from any possible stronger ocean currents. The comfortable hotel complexes, the numerous shops and the comprehensive catering and leisure facilities within Georgioupolis virtually transform this picturesque seaside town on the most beautiful sandy beach in Crete into a standardised, heavenly resort. Georgioupolis Resort. The Corissia Hotels are situated within the tranquil, picturesque village of Georgioupolis directly by the beach. Corissia is not an isolated, self-contained resort, but an open, multi-faceted facility right at the tranquil town centre. Three hotels are available to choose from for your next dream holiday in Georgioupolis. You will also find other small hotels, guesthouses and apartments in Georgioupolis village, such as the Paradise Hotel, the Appartements Papadakis, Hotel Zorbas, Hotel Eko Suites and the modern hotel, Anna’s House. The latter is situated a few hundred metres outside the village in the direction of the next locality, 'Exopolis'. Along the kilometre-long sandy beach, beyond the village of Georgioupolis, you will also find many other hotel facilities, especially in the next village of 'Kavros'. Famous hotel names are for example Mare Monte, Pilot Beach Resort, Anemos Luxury Grand Resort, Georgioupolis Resort Aquapark & Spa, Mythos Palace, Delphina Art, Vantaris Palace, Eliros Mare, Vantaris Beach, Orpheas Resort, Happy Days and Hydramis Palace Beach Resort, among others. If you decide to stay in a Corissia Hotel you have the option of making a direct reservation. Already here, or planning your holiday in Georgioupolis? At Corissia Events, you’re sure to find just the activities that will let you spend a truly interesting and diverse holiday. Entertaining events, functions and other offers are updated daily and await you here. Enjoy! All major tour operators offer a bus transfer to Georgioupolis if you have booked the holiday package with a transfer accordingly. Please note that travel time to Georgioupolis can take significantly longer, because coaches often stop at many towns and hotel resorts before Georgioupolis. If you make a reservation directly with one of the Corissia Hotels you will be offered a private transfer directly to Georgioupolis (without stopovers). As a rule, there is already a driver at the airport on your arrival and you will be driven to the hotel quickly and without any intermediate stops. At the airport, you have also the option of renting a car and driving to Georgioupolis yourself. It is usually absolutely straightforward to drive to Georgioupolis with a rental car, even if you have never been to Crete before. The town is located directly on Crete’s main road, it is very unlikely that you will get lost with adequate preparation! If you are also planning on exploring Crete during your holiday, a rental car would certainly be a very good idea. Car rental deals can be found here. You are always sure to find a taxi to take you directly to Georgioupolis at both Chania and Heraklion Airport. The public bus is certainly the most economical way to travel to Georgioupolis. Usually, however, you need to get from the airport to the bus station in Heraklion or Chania and then change buses. In addition, the public buses are sometimes overcrowded, as such we would rather advise against this option when arriving with luggage. Within Georgioupolis village, you will find several public parking spaces / parking lots. You can also park your car at the side of the road in many quiet streets. There are no paid multi-storey carparks in Georgioupolis. You can withdraw money with your debit or credit card around the clock from the ATMs in Georgioupolis village square. A branch of the Bank of Chania is also situated in town. The public bus passes by Georgioupolis every hour connecting the most important cities on Crete: Chania, Rethymno, and Heraklion. The bus stop is located on the adjacent main road, just a few hundred metres from Georgioupolis village square. Please acquaint yourself with the current bus schedule from Georgioupolis directly at the bus stop. The pharmacy is located on Georgioupolis village square. There you will find all common medicines as well as various toiletries and sunscreen. If you’re on regular medication, it is of course recommended to bring your own. There are also general medical practices with a 24 hour on-call service in Georgioupolis. If necessary, the doctor can also come to your hotel room. For medical emergencies, as well as the state hospital, there is also a modern private clinic with medical specialists in Chania. For holidaymakers who regularly need dialysis during their holiday, modern dialysis centres are available in Chania. It’s recommended to buy travel health insurance before a vacation. In the case of an acute illness or an accident, travel insurance not only enables you to be transported home as necessary without complications, but also provides optimal medical care locally, for example by highly qualified specialists. The tourist train "Talos Express"
You can reach beautiful day trip destinations close to Georgioupolis with the small public tourist train, the Talos Express. For instance, take a trip to Kournas, a mountain lake and the only natural freshwater lake in Crete, or to the Argyroupolis Springs, an impressive backdrop with small, picturesque waterfalls. Visit nearby traditional Cretan villages and enjoy many more nearby attractions at your leisure. The tourist train departs daily directly from Corissia Park. Pedal boat rental "Turtle River"
When you cross the bridge over the harbour of Georgioupolis, you will reach the small ‘Turtle River’ pedal boat rentals on the other side in the direction of 'Kalivaki' beach. As you paddle along the river of Georgioupolis, you will discover a beautiful landscape, where many small turtles also live. You can also admire nature at the nearby mountain lake of Kournas completely at your leisure with a pedal boat or canoe. The lake is only about 4 km from Georgioupolis. Georgioupolis is an ideal location from which to explore central and western Crete on day trips by bus or rental car. You can also take many of these trips also by bike or motorbike. Bring the basics, including drinking water and enough sunscreen, in a small daypack; If you want to take a short walk in between times, shoes with a firm grip are also very useful. What is the best time to travel to Georgioupolis?